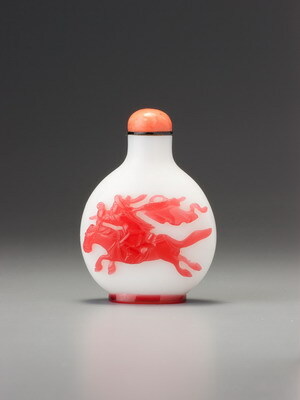 This example supplies several reasons for confidence in our attribution to the Imperial glassworks. Apart from the mask-and-ring handles associated with the court, it is extensively crizzled both inside and out (although to the naked eye the crizzling appears to be confined to the inner surface), and crizzling was a well-known feature of the early Imperial glassworks. Further supporting our confident attribution, it is of a range of glass in which we find the standard ruby colour mixed with colourless glass to the point at which it becomes a pale ruby-pink with a high degree of transparency. Glass of this nature is found most often in a series of octagonal bottles decorated with Buddhist emblems and, usually, fish. These can be confidently designated Imperial, dated to the eighteenth century, and attributed to the Imperial glassworks. As Kleiner pointed out, the mask-and-ring handles here are unusual and not yet the standardized version with its formalized, curly-pated, rather leonine- looking taotie. Had this bottle been made in the late eighteenth century, one would have expected the carver to simply repeat one of a small series of standard versions which had, by then, become well established. A carver at the beginning of the century, in contrast, would be more likely to treat the feature as a vital decorative element and create something individual. We suspect we are dealing here with a bottle from the earlier end of the dating range given, possibly even from the late Kangxi or Yongzheng periods, but in any case no later than the mid-Qianlong reign. Whenever it was made, it must number among the most striking of glass bottles, with its perfect formal integrity, intriguing style of mask-and-ring handles and impeccably crisp and confident detailing. The slightly flared footrim is as neat and elegant as any known.